If you are using RSS Reader to read Tweets then you may be noticed that, In RSS readers Tweets are displayed with Twitter Username and there is no way to remove those username. It won’t looks cool to read those tweets if it contains Twitter username and it also takes some space. So it is good to remove those usernames from RSS readers. 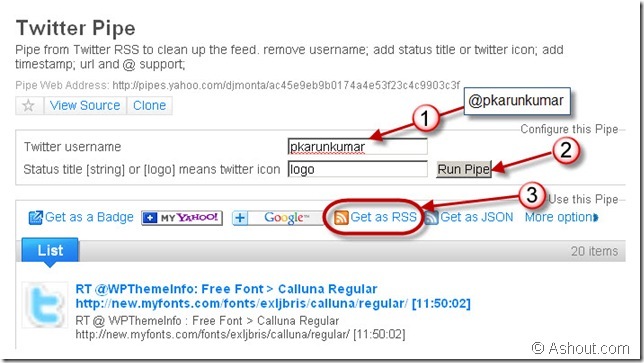 Here is a trick to remove Twitter usernames from RSS readers easily. Twitter is providing RSS feed for every Twitter accounts so that users can easily Read those tweets in their favorite RSS Readers (ex: Google Reader). If you are using this option/method to read other tweets then you may be noticed that every tweets what you read in RSS reader it contains Twitter username and it make ugly to read tweets and occupies some space. Whenever we try to read those tweets, first we see the twitter handle and then only we see actual tweet. If you are bored and don’t like to see those twitter username/handle in RSS readers then you need to make some small tweak. By using Twitter Pipe we can easily clean up the feed by removing username. Now your tweets looks cool. In Every tweets you don’t see Twitter username in RSS feed, instead it adds their profile name at the bottom of the title. Never tried in rss reader. Will take this in mind whenever try! never used rss reader but will try for sure…..